Continued fromGetting the Right Answer Needs the Right Question... Part 1. On the other end of the scale is under-thinking or not thinking about the question at all. Under-thinking will also give us the wrong question. The tendency is to not think at all and ask the questions we normally ask. We ask these questions not because of any specific reason. We ask them on autopilot and we have an expectation of the answer. Sometimes, it is a force of habit. We are just used to using these questions in that particular situation. This short-hand can be useful as a starting point but again the same principle applies, think whether will the question being asked give us the answer we need. We need to think about the question, the answers it may give and whether those answers are the ones we are looking for. Change the focus of the question. If the question is general, make it more specific. If the question is more specific, make the question more general. For example, rather than asking what we tool we need, refocus on the more general goal of the purpose of the tool. Ask how can we do the job better or how can we do the job without the tool. If the question focused on the more general goal of achieving success, refocus on how to reach specific goals that define the success. Change the context. If the question is narrow, make the new question cover a wider area and areas that are noramlly off-limits to the question. Rather than trying to solve just that one part of the problem, ask the questions that will solve several pieces at the same time. Sometimes, the solution or at least a part of it, lies with other people. Another method is to remove information or change perspective of the question. Instead of asking how the task is supposed to executed, ask how should the task be executed. Flip it / work backwards. Normally, we define the solution criteria and ask what would yield them or what would fit. Try reversing the process and look at the possibilities available and how each of them would fit as a solution. Rather than trying to come out with something new or something ideal, use the options available to us at that time and situation. The options can be evaluated individually and in combination. This is very useful when there is little time and few resources. By doing it this way, we can be open to other solutions that we normally wouldn't be thinking about. 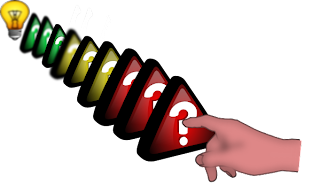 The purpose of the techniques above are not to change the nature of the question but offer shortcuts as to how to think differently about the questions being asked and create new questions. We may come out with other questions or other ways of to re-approach a question as we go along. At each step, we will keep in mind of the answers that we are looking for and tweak the questions accordingly. We can label this innovative thinking if it helps other people understand or participate. Since we are under-thinking and working from a set of questions we automatically ask, we must evaluate which questions we should discard. The idea is to narrow the set of questions to limit the scope of inquiry. We will be asking follow-up questions. So having fewer questions to start with will mean fewer follow-up questions. This reduces the amount of time wasted. If working within a group of people, we should share the reasons why we are not asking certain question. Others may think that certain questions shouldn't be discarded so soon. It may just be that we need to revisit and ask those questions later. Or that we need to ask the stupid questions. Knowing to ask the right question will yield the most useful answers. So don't be afraid to think before asking or to ask at all.